En el artículo de hoy os ofrecemos consejos sobre cómo viajar a Londres: descubriremos desde que monumentos ver en la ciudad londinense y cómo moverse en transporte público por Londres, hasta qué ropa llevar para lidiar con el “maravilloso” tiempo de la capital inglesa. The Palace of Westminster — commonly known as The Houses of Parliament — is a Victorian Gothic building which houses the two chambers of the UK governments, the Lords and the Commons. St Stephen Tower, with its famous clock and bell (better known as Big Ben) is part of the Palace, which is on the banks of the River Thames near St James’ Park. For more than 900 years, the infamous Tower was where traitors were imprisoned and executed. Now it is the most popular tourist attraction in London, and is where to go if you want to catch a glimpse of the world-renowned Crown Jewels. Like the Palace of Westminster, the Tower of London is also next to the river, and is right next to the iconic Tower Bridge, which still periodically opens up to allow shipping to pass by. The current Cathedral was built by Sir Christopher Wren following the Great Fire of London in 1666. It is the second largest cathedral in the world, after St Peter’s Basilica in Rome. Go to the Whispering Gallery, where the acoustics enable the slightest sound to travel, or marvel at the majestic dome. This 135-metre high wheel was constructed in the year 2000 to celebrate the arrival of the new millennium and is one of the best places to get a view across the city. From the top point, you can see as much as 40 kilometres away, although the price is a little bit steep if you want to buy a ticket. Trafalgar Square was built in 1830 to commemorate the British naval victory at Trafalgar, against the French and Spanish. 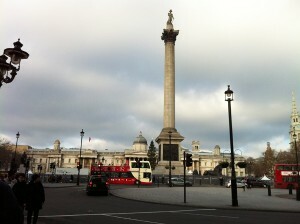 The centrepiece is a 50 metre high column, on top of which stands a statue of one-armed naval hero Admiral Nelson. The square also hosts the amazing National Gallery (entrance free) which hosts one of the widest collections of art in Europe. If you go to London in the summer, make sure to go prepared. It is not true that England is perpetually covered in rain and clouds. Things can get hot and sticky in the summer, and in a city with a boat-covered river and lots of parks, there is plenty of opportunity to enjoy sunny days. Therefore light summer clothes such as shorts, t-shirts and sunglasses are a good idea. However, the big difference between Spain and England is that the weather in summer can get rainy and chilly at more or less any time, and in general can be very changeable: rainy one minute, sunny the next, then thunder and lightning. Londoners therefore dress in ‘layers’, wearing a light sweater or jacket that can be removed easily if the weather improves. Bring some good waterproof shoes, and not just flip-flops or trainers. You will see some locals wearing few clothes even on cold, overcast days. Do not imitate them: they have trained themselves for years to do this and you don’t want to risk spending half your time in London in bed with a cold. It is a good idea to make an effort to get familiar with English opening times. The good news is that bars, cafés and restaurants are open more or less all the time. You can eat and drink whenever you want, and although most English people eat earlier (lunch at 1 and dinner between 6 and 8) eating at Spanish times need not be a problem — although it might lack for atmosphere! Shops on the other hand close at 6pm most of the time, although they are open on Sundays at often open late on Thursdays until 8pm. In theory, pubs can open 24 hours, and in other parts of Britain now open similar times to the rest of Europe. However, London is the exception, where almost all pubs still close at the traditional time of 11pm. Public transport in London is quite expensive compared to other European capitals. A single one-zone tube ticket costs 4£ (almost 5€!) for example. The different forms of transport are: the tube, which covers most (but not all) of the city and is best for travelling longer distances. Buses are slower, but the iconic double-deckers and Routemaster buses are one of the best ways to see the city by travelling around the centre. Black taxis are expensive, although all taxi drivers have to take an official exam to prove they know every street in the city and so if you are going somewhere out of the way and don’t have much time they are definitely worth considering. And surely everyone should travel in such style at least once in their life. There are also a lot of overground trains, which serve parts of the city the tube network does not reach, such as the South-East and the outer suburbs. They are also a good way to go on day trips to nearby towns and cities such as Brighton (if you are missing the beach!). 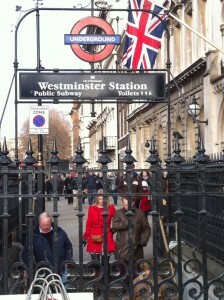 One way to save time and money in London is by using Travelcards. A travelcard will enable you to travel unlimited on buses, tubes and trains within a certain area (one to six zones) . There are also prepaid Oyster cards which are convenient and good value but only for those planning to stay for at least a few months in the English capital. Heathrow is on the Piccadilly Line and so it is possible to get to the city centre on the tube. However, if you have a lot of luggage you will be better off taking a taxi or the Heathrow Express to Paddington. There are several trains from Gatwick to Central London. The quickest and most expensive is the Gatwick Express (20£ single or 35£ return to Victoria). You can also use the slower but cheaper Southern Trains service to various stations in central London. It is a good idea to make sure you get a European medical card before going to London (or anywhere else in the European Union) just in case you need it.